An independent auditor's report into financial management of the Asian Football Confederation (AFC) by its disgraced Qatari president has set the stage for major investigations by Malaysian judicial authorities and international soccer bodies into governance of world soccer and the awarding to Qatar of hosting rights of the 2022 World Cup, the world's biggest sporting event. The report by PriceWaterhouse Cooper (PWC) of disgraced former FIFA vice president Mohammed Bin Hammam who was last week suspended for 30 days as head of the Asian Football Confederation (AFC) as a result of the report suggests cases of money laundering, tax invasion, bribery and busting of US sanctions against Iran and North Korea. The report provides the Kuala Lumpur-based AFC with the reasonable suspicion of a legal offence that it under Malaysian law is obliged to report to authorities. It also leaves the AFC with little choice but to launch a full-fledged investigation of its own. The AFC, which has Malaysian nationals, including a member of a royal family on its executive committee, can extend Mr. Bin Hammam’s for a maximum of another 20 days, ten of which must be used to prepare a case against him. The report coincided with a verdict last week by the Switzerland-based Court of Arbitration of Sport (CAS) that acquitted Mr. Bin Hammam of charges that he had bought votes for his failed challenge last year of Mr. Blatter in the soccer body’s presidential election. The court said FIFA had provided insufficient evidence but went out of its way to state that its verdict was not a declaration of innocence. Suggesting that it believed that Mr. Hammam was guilty, the court effectively invited FIFA to retry Mr. Bin Hammam on the basis of enhanced evidence. The PWC report, according to a source involved in AFC’s investigation of Mr. Bin Hammam, said that it raised questions about the timing of flows of monies in and out of AFC accounts linked to the charges that Mr. Bin Hammam had sought to buy votes of Caribbean soccer officials in his failed challenge to FIFA president Sepp Blatter in the soccer body’s presidential election last year. The charges formed the basis for Mr. Bin Hammam’s ousting from FIFA and for the CAS case. “The report prompts questions about the flows of money from the AFC to other (soccer) confederations that were perhaps intended to influence matters like presidential elections or the World Cup. .. A direct link appears to exist between the inflow of just under $1 million into MBH’s (Mohammed Bin Hammam) sundry account and the payment in May of $1 million at a Caribbean Football Union meeting. That link is still a bit unclear,” the source said, adding that it would likely be subject to further investigation. Feeding into imminent multiple investigations that could provide the monkey wrench to clean up scandal-ridden world soccer is FIFA’s appointment earlier this month of former US New York state attorney Michael J. Garcia as its anti-corruption prosecutor to look in to the awarding of the Qatar World Cup as well as multiple corruption scandals in recent years. Qatar has over the past 16 months sought to put a distance between itself and Mr. Bin Hammam official, denying that he played a role in its bid. Sources close to the investigations of Mr. Bin Hammam believe that the inquiries could produce a different picture. 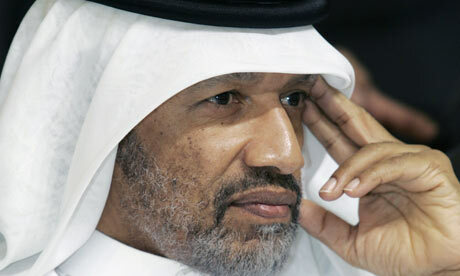 PWC was given a limited mandate and resources to do an initial, precursory investigation of specified accounts and dealings of Mr. Bin Hammam seven months after the AFC decided on a far-reaching restructuring designed to make the organization more democratic and transparent as well as rollback changes that effectively concentrated power in the Qatari’s hands. Allies of Mr. Bin Hammam in the AFC executive committee some of which according to the PWC report dated July 13, 2012 were beneficiaries of the Qatari’s dealings are believed to have delayed the commissioning of the audit. The report cites a slew of unjustified and at times questionable payments to AFC executive committee members and their families and Asian and African soccer officials and associations as well as to Jack Warner, the disgraced head of North and Central American and Caribbean soccer who resigned last year to escape investigation of his alleged role in Mr. Bin Hammam’s purported bribery of Caribbean Football Union executives. Representatives of various federations named as beneficiaries of Mr. Bin Hammam’s largesse denied knowledge of any payments or insisted the transactions were legitimate. The report further questions a $1 billion master rights agreement (MRA) between the AFC and World Sport Group negotiated by Mr. Bin Hammam without putting it out to tender or financial due diligence. The agreement fails, according to PWC, to give AFC a right to audit WSG’s services or costs. “In comparison with similar-type agreements for other sports, it appears that the current MRA may be considerably undervalued,” the report said. n handed out some $700,000 to family and friends, including buying suits for himself and Confederation of African Football head Issa Hayatou who is likely to a target of the FIFA investigation of the Qatar bid, an aiirline ticket for AFC Vice President Ganesh Thapa’s wife and son; settling a $19,767 car loan belonging to former AFC assistant secretary general and WSG vice president for corporate security Carlo Nohra; purchasing for himself fitness equipment in Kuala Lumpur and Doha; a $10,000 Bulgari watch; paying $15,000 for unspecified cargo from Switzerland to Qatar, and shouldering the dentistry, evening gown, facial and saloon charges of his daughters and honey moon of his son; and transferring $100,000 to his wife with no justification. "The arrangement with Mr Hammam's use of the sundry debtors account is, in our view, highly unusual and reflects poor governance. This use by Mr Hammam of the sundry debtors account continued even after the external auditor's recommended that it be stopped. Our review indicates that it was common belief that this account was for Mr Hammam personally and all funds flowing through it were his personal monies,” the report said. "We question why Mr Hammam would conduct his personal financial transactions through the AFC's bank accounts when the documents we have seen indicate that he already has several personal bank accounts in various countries," the report said.